As usual a mix with comment, review and news. Contributions always welcome, no payment alas, And send to tony.jasper@btinternet.com I did get a little roughed up on Facebook from a source who seemed to think here was iniquity – no payment. The simple thing is this – No money comes in from this on-line magazine. I just pay out for its production. I deceive no one. That Mr Angry doesn’t have to write for Crisis. If there was money going into the Jasper Bank account then sure he should receive some recompense. As it is I would have no qualms about contributing if I liked someone’s vision and would not ask for payment. Tell me the source makes money, then yes, pay up. I have living to make. And their bank accounts with back-handed cash. Ignoring jeers from the fringe of the crowd. For elections they lost and promotions they missed. I have no reason to disbelieve her. She simply says: ”I Am not a saint. I am a noise.” On the other hand I refute the second claim, for I, and millions have loved her vocal tones and ability, less sharp these days, but then age has its way to produce a richer down register sound. Ah, ‘age’ for Joan (Chandon) Baez, voice of protest through five decades hit 75 this past January. There’s a beautiful double CD to celebrate that life milestone. This US legend belongs to a band of singers who may not seemingly sign up to a church or synagogue ,but none-the-less cannot get Jesus out of their systems. Go off to your computer and find the YouTube moment entitled ‘Jesus Christ – Glory Hallelujah.’ Her albums contain many religious songs, and if at times she has been somewhat negative about the religious aspect of her upbringing, well, at the same time, from the very early albums, she was singing Christian material. She is often given a ‘folk’ label, and yes, in early times, she delivered her version of traditional British folk material, but as with even a Judy Collins, her song catalogue is these days more into what is loosely termed ‘contemporary’ that might be rock orientated, folk rock, country, and gospel. and she has also taken on board world music. Those early years of the 1960s, counter-culture time, saw her consorting with one Bob Dylan, be among the first to sing his material; theirs seemed the ideal marriage but it was not to be. Songs of protest, civil rights and social justice adorn many her albums. Like Dylan, in early times she was in the vanguard of those who feared a Third World War and marched against the every rising ‘war’ budget and the testing of horrific nuclear weapons. She would stand against the American adventures in Vietnam and indeed went there and sheltered with those under bombing threat. She was born on Staten Island, New York, her grandfather was a Methodist minister and ministering to Spanish congregations, and so Joannie is fluent in that language. During the early years her immediate family became quakers and she says from that tradition there came her commitment to pacifism and social issues. She sang on the morning of Martin Luther King’ speech at the march on Washington for civil rights – the song remembered is the traditional spiritual ‘Oh Freedom’. Naturally she has sung ‘Amazing Grace’ and done so with childhood fervour, enough for some to claim she sings it with more conviction than any other. At least six of her albums contains the song including “Greatest Hits’ and there’s the powerful ‘God is God’ written for her by Steve Earle for the album “Day After Tomorrow.” She sings ‘Mary’ – in lyric attempting to see into Mary’s feelings. (album:Noel). For me the most moving moment in specific Christian terms is that so simple yet so moving rendition of ‘Let Us Break Bread Together’ and located on album, ‘Brother in Arms.’ and ‘Blessed Are’ on the ‘Let It Be’ set that explores Matthew 5. Apart from mentioning her Christmas set ‘Noel’ that obviously has familiar hymns and carols, for sheer vocal rawness It’s Virgin Mary (Had One Son) and scurry along again to YouTube and the live recording with Bob Gibson, for there are numerous other takes of this song. The new album, at last you might say, is “75th Birthday Celebrations” which brings her into song with many of her musical friends, or legends to the rest of us. I mean who would not like an all-star line-up that brings together Paul Simon, Emmylou Harris, Judy Collns, Mary Chapin Carpenter, Mavis Staples, Damien Rice and Jackson Browne, to name a few, as it were! She sings ‘God is God’ – does so acoustically and right at the beginning – talk about testimony! There is ‘Oh Freedom’ and a spiritual that has always Popped up from time to time ‘Swing Low, Sweet Chariot’ , plus the old gospel number ‘The Water is Wide’ . It sounds a truly happy occasion! The song selection apparently designed to take her through various life stages. Tributes have flowed, and at very least Ms Baez has shown multiple generations that music can inspire and move and be a potent force for good, so much so that tyrants of nations have often first and foremost attempted to stop people hearing music , and above all singing. For Joan BAEZ It’s been a long journey since the very first album in 1960. Should you wish to know more about this remarkable woman, read her memoir Joan Baez and A Voice to Sing (Simon & Schuster). Some time ago I wrote a book about Paul McCartney, and his band of the time Wings. In the process of compiling I came into contact with various American sources, and from whom I learnt that I was dealing with an imposter, that the British Paul from Liverpool was not Paul of the Beatles. The great pretender was unknown other than he was now Paul. The one-time scouser was dead, but for commercial reasons, and the well-being of fans it was construed that a decision had been taken to preserve the image, and so someone of an uncanny likeness found. The proof behind this seemingly absurd remark, but taken seriously by US devotees, lay in a supposed intricate clue ridden path for those with eyes to see, and these found in-part via the imagery of certain album covers and publicity hand-outs. Gather these pointers together and they spelt out: McCartney dead - someone else masquerading. All very un-settling; more so, when some believe it true. So to a new book on the great singer Elvis Presley has numerous disturbing elements, and is published August 16 to tie in with the anniversary of his usually accepted demise, only in terms of this book, some feel that maybe he didn’t die, or, if he did, others believe he’s out of the tomb. In many respects this book largely introduces us to the American mind that could cook up a second McCartney, only in a different form and guise we meet those who like to think Elvis is a Jesus figure, and approach him in religious frame of mind and practice. It could be soon upon us - the First Church of Elvis. Harrison likes to quote religious figures, one of whom is Minister Anna of Australia, and she is in no doubt that Elvis fans are so devoted that they dismiss as ridiculous thoughts that there was drug-taking and lustful behaviour from the King. There are those who believe in the star’s resurrection, and so there is talk of posthumous sightings, and if an Elvis cloud was seen over Graceland shortly after his death so to some say that “ even as recently as 2011 Elvis was taking advantage of favourable meteorological conditions to reveal himself in a cloud over Spain.” Greece might have hoped a sighting would boost their lagging tourist economy, but Spain was the chosen. Harrison tells us of people glimpsing the risen Elvis at supermarkets and shopping malls, and “he was even seen in the crowd at President Barack Obama’s inauguration in 2009. One person recalls of a “close encounter” where he doesn’t confess he is Elvis and in the case of this Detriot News reporter :she didn’t ask outright, but Kelly Burgess is in no doubt she had a close encounter.” If I were her editor, I would be asking some hard questions as to why a potential global story was lost because she didn’t observe the first rule of journalism – to ask questions. The Detriot News could have made the big-time. And we would have all been shook up. Undoubtedly Elvis had a deep religious span of interest, from singing old-time gospel songs to a religious territory that would surely be found heretical in his old-time Baptist church as he explored the nuances of spiritualism. Harrison touches upon this in the later stages of his book. Professor Christine King is instanced and she nis right to say that Harrison brings us into Elvis as myth, archetype-hero, martyr and saint, although in terms of the latter apart from bringing much joy in his singing it is not easy to find evidence that Elvis even approaches a Geldof - in at least confronting the excesses of capitalism or even in the slightest to challenge the American contradiction of taking capitalism and religion as unquestioned bed-mates. 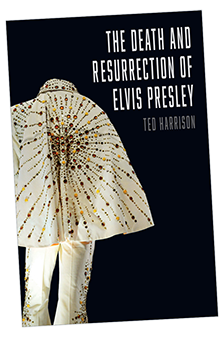 The religiosity of the American psyche has often gone haywire, sometimes disastrously so, and there is enough in Harrison’s final pages in the spinning of a lines such as “ He was godlike to some of his followers” and “If following Elvis isn’t a religion yet, then it is a very effective religious substitute,” or “Elvis transcends fashion. He adapts to every new technology. He will undoubtedly be a major force in Western culture for decades to come” to make me wonder whether Ted and yours truly are living in the same world. Perhaps the author writes with ‘tongue in cheek’ as the absurdities of comparison are neatly laid out. To be sure many fans have no difficulty in reworking an Elvis far from the last days, overweight, heavily dependant on medication and cutting a tragic figure for someone once so great. If Elvis had been a Roman Catholic the US fans would be out there now assembling data for the Vatican toward sainting the greatest popular singer in recording history. I settle for Elvis the great recording artist. The rest? Pass. who resigned 2000 and said he had a lifelong struggle to believe. This is an astonishing effort to compress thousands of years of history. Not all groups get a look in, so no quakers, no Methodists, no Baptists, and with the latter two pushed away that represents fair old millions of faithfuls or misguideds. Holloway does think religion is here to stay in the foreseeable future. Fetching some positive reviews. A really absorbing book that focuses on sacred music as a potent force. While religious music considerations dominate the text does take in pop, and Radio 0ne but its main concern is to debate and ensure the future of sacred music in western culture. JOAN BAEZ – 75TH birthday Celebration. LAURA MVULA – The Dreaming Room. Karl Dallas gains a two page tribute in the Morning Star daily paper. A lifelong activist in the socialist movement, with much contact with this writer in the world of folk and contemporary music fields, he wrote widely, especially for the once great music mag, Melody Maker. I, to, as a` music journalist had much contact with KD. He was a special guy. TJ. For some of us, it’s stay at home with our miraculous flushing loo and hot shower - so more attractive than Coldplay, Adele and, we have the Beeb with Mark and Jo. Mark burbles away incessantly, and Jo, apart from looking ace, talks nine to a dozen, and smiles and smiles and smiles at the camera. JTC in its summer revue does a take-off of the famous two. JASPER: hello and hello welcome to Glastonbury. LINDA: Yea, Yea, hello, welcome. What a year. JASPER Yea, fantastc, fantastico. Fantastic. I mean all those people. JASPER Mustn’ forget the mud. LINDA: Truly awesome.All part of the experience. JASPER I mean all these people. JASPER Can’t say I miss the loos. JASPER Yea some great. great, great music. LINDA And don ‘t forget some spotting – stars just wandering about. Awesome. LINDA Pyramid had some tasty stuff, really tasty. JASPER loved their You’re a Germ. LINDA Adele. Yes, and again Yes. I mean did she think she was singing for the world? So natural. Unaffected. It just came – that voice. Heard by the world. LINDA Coldplay, great set, really great, great. JASPER Don’t think I’ve heard the better. LINDA they’ve been before and they’ve conquered again. Playing to the world here. JASPER My, my, what a triumph, been before, come back again, awesome. LINDA Yea, can’t wait for 2017. LINDA SLADE has been touring with me with Summer Revue. These days she lives in Los Angeles and with her background of an actor, director and voice coach she has busied herself with a series of books on voice. When you speak publicly does your voice often sound strangled and blocked? Do you feel sometimes as though your voice is too deep and gravelly, or high-pitched and nasally? Have you experienced a time when you were trying to communicate something important and your voice sounded as though you were a little girl or little boy, inexperienced and naïve about what you were talking about? There is a way you can extend your vocal range to give it the color, the expression and the enthusiasm you want, which will support the message you are trying to convey. In these chapters I will look at pitch, intonation, and inflection. Pitch is a note on a musical scale and intonation is the "tune or melody of speech." Inflection refers to the vocal movement or glides on the individual vocal notes. When we speak the sound is carried to the listener literally by one molecule of sound bumping into another, creating sound waves similarly to the way water ripples are created when a pebble is dropped into a pond. When we’re loud or shout at someone it is like hurling a heavy rock into the water. The ripples are deeper and stronger. Vocally, shouting is like ‘hitting’ another with sound. It may push them away. Sometimes that’s what we desire. But in order to draw people to listen to us, we need to entice them with our voice. A voice that more gently reaches the listener may draw him or her closer. This book will help you to discover the authenticity in your voice and will give you techniques and exercises to support this voice. It is this voice that will get you heard and noticed. A truthful voice, with a truthful message, will always win the receivers ear. If you want to communicate clearly and authentically then this is the book for you. Packed with lots of exercises and pictures to support you on your journey of rediscovering the power and beauty of your Authentic Voice. In this third book I will be looking at how a particular vocal pattern, adopted at an early age and often used to define or reinforce the image of the speaker can become stuck and leave one sounding vocally dull or monotonous. The exercises that follow address ways of breaking age-old patterns and will support you in bringing vocal color or tone back into your voice. Some of the vocal patterns I discuss include the nasal sound: a vocal quality that sounds as though the person speaking has a cold (Speaking through the nose in a blocked way). The high pitched, questioning voice as I call it, is another rigid vocal pattern as is the dull monotonous voice that communicates no enthusiasm in anything. Each voice can represent a particular identity for the speaker so be warned. As you explore these voices and work on exercises to release the voice you may find that people start to relate to you differently. Your voice may start to take on a different quality and you may start to reveal the true essence of your authentic self. The outward image you have intentionally, or unintentionally created, may be replaced by a presence that reinforces your truth and you may find yourself speaking with a voice that reflects that inner truth. Experiment with this and see what happens! The other subject I have tacked in this book is the habit of mumbling; especially when the speaker finds themselves placed in a vulnerable position and resorts to that mumbling voice which distorts what they truly need to communicate. There are some fun exercises to help get those articulators working and to encourage you to speak fearlessly and clearly in all situations and environments. Enjoy!